Artificial flavors. Per 1 Tbsp: 35 calories; 0 g sat fat (0% DV); 20 mg sodium (1% DV); 5 g sugars. Coffee's perfect mate. Everyday indulgence. Coffee-mate is always working to awaken your coffee routine with an endless selection of delicious flavors. Whether you're looking for a slight twist on a familiar flavor or a different kind of delicious, chances are you'll find a new favorite. Good food, good life. Good Question: I love coffee! Can I add a creamer and still taste the true coffee flavor? Good to Know: Absolutely! 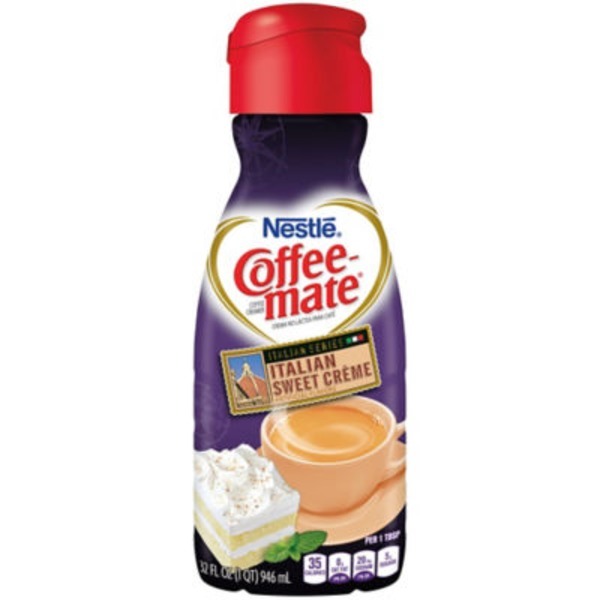 Coffee-Mate Italian Sweet Creme was made just for coffee, so you can have it all - a rich, creamy cup that still lets the coffee flavor shine through. Good to Remember: A good rule of thumb is to know how much Coffee-Mate you use. A single serving is one tablespoon. Use in moderation for your perfect cup. 1 tbsp = 35 calories. Nutritional compass. Enjoy with a cup of Nescafe. Please recycle. Non-dairy. Lactose-free. Cholesterol-free. Gluten-free. Water, Sugar, Partially Hydrogenated Soybean and/or Cottonseed Oil, and less than 2% of Sodium Caseinate (a Milk Derivative)**, Mono- and Diglycerides, Dipotassium Phosphate, Cellulose Gel, Salt, Color Added, Natural & Artificial Flavors, Cellulose Gum, Sucralose, Carrageenan. **Not a Source of Lactose.